Malta Dairy Queen Grill and Chill is open year round. Enjoy the beauty of Montana on the Hi-line. Take the short drive to Sleeping Buffalo, near Nelson Reservoir where you can take a swim, picnic or do some great fishing. Take a ride just 15 minutes away to Lake Bowdoin where it is noted for its wildlife and beautiful birds. Take a ride around the lake and feel close to nature were the deer and antelope run free. Visit Leonardo the world's most perfect mummified dinosaur, entered in the Guinness Book of Records, at the Great Plains Dinosaur Museum and the history of the famous outlaw Kid Curry. Discover other dinosaurs and local history at the Phillips County Museum. Both museums are located about two blocks west of of us. Feel the hospitality of a small home town where you are greeted with a smile. Enjoy a hot meal, soup or salad and top it off with a DQ Royal Treat. 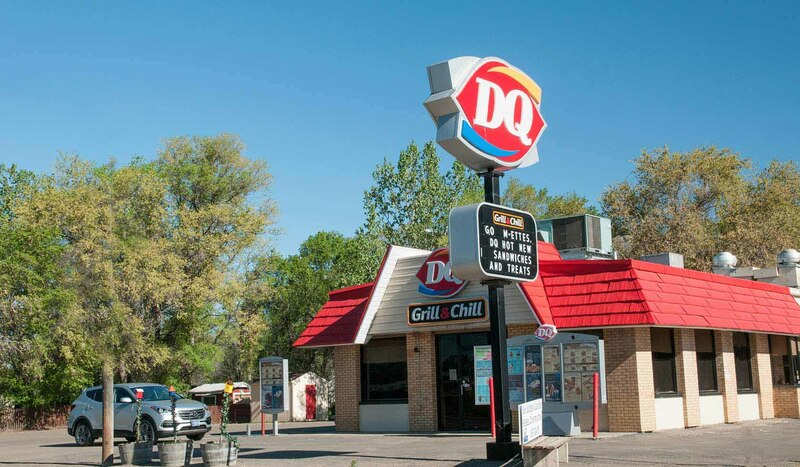 The Malta Dairy Queen Grill and Chill is located on Highway 2, 6 blocks east of the intersection of Highway 191 and Highway 2 in Malta. We are located 3 blocks east of the Amtrak Depot, 2 blocks east of the Phillips County museum and Great Plains Dinosaur Museum.The Malta Dairy Queen Grill and Chill is located on Highway 2, 6 blocks east of the intersection of Highway 191 and Highway 2 in Malta. We are located 3 blocks east of the Amtrak Depot, 2 blocks east of the Phillips County museum and Great Plains Dinosaur Museum.